GLORY TO THE FALLEN HEROES! LONG LIVE THE PEOPLE'S WAR OF PERU! LONG LIVE THE 30TH ANNIVERSARY OF THE GREAT PROLETARIAN CULTURAL REVOLUTION! YANKEES OUT OF THE BALCAN! SUPPORT THE PEOPLE'S OF THE BALCAN! 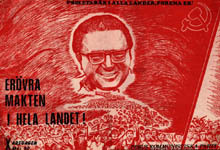 LONG LIVE CHAIRMAN GONZALO, THE GREATEST LIVING MARXIST-LENINIST-MAOIST ON THE FACE OF THE EARTH! DEFEND COMRADE FELICIANO'S LIFE! LONG LIVE CHAIRMAN GONZALO! THE PEOPLE'S WAR WILL INEVITABLY TRIUMPH! 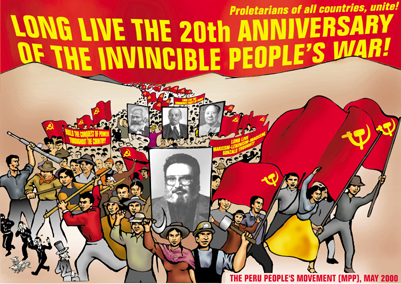 LONG LIVE THE 20TH ANNIVERSARY OF THE INVINCIBLE PEOPLE'S WAR!